Last year I wrote about the iPad as a laptop replacement. While much of what I wrote still applies, especially the preference for viewing PDFs and photos on the iPad, I have noticed that the iPad has been an imperfect replacement for a laptop when it comes to text generation, e.g. legal documents or blog posts. Although I have been disappointed with typing on the iPad, I think the iPad has the potential to be great medium for capturing handwritten text. I think one of the main drawbacks to typing is just the tablet form factor. It is great for holding in your hand for viewing but somewhat awkward to place on a lap to type. I don’t really have a desk at home but I could sit at the kitchen table to type on the external keyboard thereby defeating the joy of being able to camp out on the couch with iPad in hand. I have considered trying the ZAGGmate keyboard case because then I would have a setup similar to a laptop, which in the past was used extensively on the couch without problem. One place where the iPad has the potential to be really useful is in client meetings where it has been great to be able to pull up documents and even online court material such as statutes or dockets and pass it to the client for viewing. But having to take notes on a legal pad and then scan the paper back into the computer detracts from my paperless office workflow. I really would like to have better handwriting based apps for note taking. Lately I have used the BoxWave Capacitive iPad Stylus and the Penultimate app with limited success. The font is not as fine as a pen and paper so you can take fewer notes per page as compared to paper. The success of the original iPad and the introduction of the iPad 2 and the Motorola Xoom show that the tablet is the next big thing. I just hope that these tablets become better substitutes for the legal pad with a finer pointed stylus and improved handwriting recognition apps. Do any of you have suggestions for iPad apps that do a good job for handwritten notes? 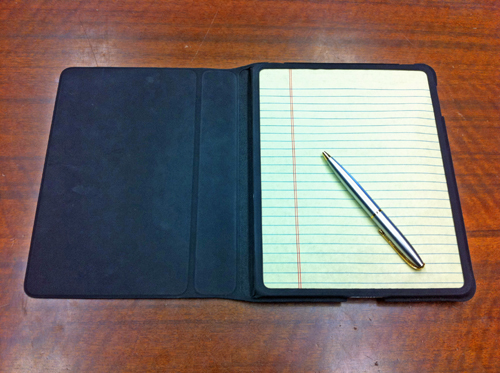 How do you use your iPad in your legal practice?